I just read Shonda Rhimes’ new memoir for a book review (to post on Monday). In it, I learned several things, some of which I could have guessed. One: She loves politics. Watching CSPAN for her is like watching her favorite soap. Two: She also loves red wine at the end of the day, along with buttered popcorn. Three: Rhimes really doesn’t get enough credit for all she’s accomplished. She created four network prime-time series with women as leads, three of which are still on the air. She writes for strong women, and puts them at the center of her dramas. This is not a thing that should be overlooked. I flashed back to Rhimes’ memoir this episode because this entire hour was steered by the strengths of three women, going after what they really wanted. Olivia, Mellie, and Susan commandeered this episode. There were no effective Papa Poe rants (are any of those effictive any more? ), no Fitz “I wait for you!” speeches, no Cyrus diatribes. Olivia, Mellie, and Susan got what they wanted and for the most part, helped each other out while doing so. First up: Mellie, the Virginia junior senator filibustering about Planned Parenthood. I love this because although Mellie is Republican, which even she herself calls out, she’s still female, and is so fed up with being shoved around by Fitz and the Senate judiciary committee that she decides to filibuster on the fly to kill the spending bill that would put Planned Parenthood in danger. Unfortunately, commentary from the old white male senator was tossed in to tell us what was going on (“I don’t believe this, she’s filibustering”), but it was excellent nonetheless, from the groans from the other members of the senate when they realized what was going on, all the way to the cheers (from female senators) and boos Mellie received at the end. 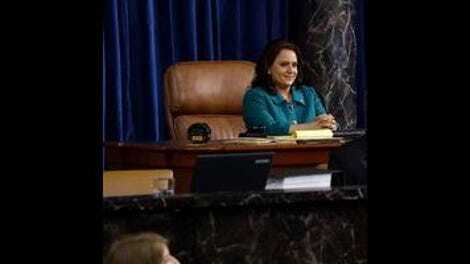 Not only noteworthy for the win it brought Mellie, the filibuster also inspired notable reactions in two other characters. It brings in VP Susan Ross (likely orchestrated by Olivia), who fortunately remembers that she’s the president of the Senate, so that poor Mellie can go to the bathroom, in a cheerworthy moment. Susan’s “Let’s talk about gonorrhea” pronouncement to the dismay of the Senate was one of the biggest (only) laughs of the night. Kerry Washington again proves what kind of actress she is with her wordless responses to Mellie’s televised rant. Olivia doesn’t need to say anything for us to realize how much she is envying Mellie her moment in the spotlight, her chance to impact policy, especially when Liv is now on the other side chasing down snickerdoodle recipes. Which helps lead up to this season’s climax so far, the latest showdown between Fitz and Olivia. When Olivia bails on the White House, this does not seem as far-fetched as it might have, because Scandal has been offering us previews of this moment for weeks. For example, Olivia searching for moonshine, just like Mellie a while back. Which reminds us of when Mellie taunted Olivia about how many Christmas trees she was eventually going to have to decorate, and now here’s Liv, stick in that same domestic stronghold (as indicated by Fitz’s predatory move of transferring her into the White House last week). We all could have predicted that playing second fiddle to Fitz was not going to be enough for Olivia, and sure enough, it isn’t, leading her to abort Fitz’s child (in a heavy-handed nod to a reason why that Planned Parenthood funding is so important) and possibly break up the two for good. As Jake pointed out to her recently, she was afraid of being tied forever to Fitz, and a baby definitely would have cemented their relationship for good. So in what appears to be their finale relationship fight, all the resentments in their relationship comes pouring out, in an incredibly well-acted scene between these two actors: How Olivia feels trapped by Fitz, even as she does his job for him (I actually gasped when she finally called him incompetent). Fitz’s “We tried” certainly sounded final, as incredible as that seems. The awesome trifecta of women at the helm of this episode made everything else that happened even more inconsequential. Eli and Huck talking about family, as Eli continues his quest to be father of the world by calling Huck “son” (Huck has an actual moment of clarity and tells Eli he is the father of no one). Jake tracking down the real culprits behind the Lazarus project, with a graphic shot to the head to remind us that he’s a stone-cold killer. Eli getting dropped off at home, which is insane; even if he didn’t kill Elise, he’s still responsible for the deaths of so many people, for what purpose is he still around? Rosen and Lizzie are apparently the kind of couple that will never use a bed, and also the kind that aren’t ready for Christmas gifts, so Susan Ross, who deserves better, gets Lizzie’s scraps. And Charlie returns for a Christmas shoplifting feel-good for Quinn? Rhimes strings these moments together at the end, as Eli welcomes his “son” Jake into his home. Mellie gets a nice moment with her two children in front of her tree, while Fitz would prefer to drink and sulk in front of his. But all that is eclipsed by Olivia finally getting a new couch, and curling up in front of the Christmas tree she must have assembled within a half-hour and smiling over her own huge glass of red wine (can someone really do that so soon after having an invasive medical procedure?). After losing herself in Fitz for awhile, she is back to herself again. But this ending, likely as it’s meant to, brings up many unanswered questions. Namely, what does this mean for the rest of the show? In Rhimes’ book, she dedicates a chapter to how she never wants to get married, and broke up with her fiancee last year after she came to this ultimate realization. Many of her heroines have the same thoughts on the institution of marriage: Grey’s Meredith and Derek got married on a post-it first; Cristina Yang ultimately chose her brilliant career over her love for Owen; and marriage brought mostly torture to HTGAWM’s Annalise Keating. In the world of Scandal, Olivia and Fitz have been the sun the rest of the show revolved around. If this really is the end of them (which I doubt, somehow, even as final as that fight scene seemed), Scandal seems incomplete. Olivia aborting her and Fitz’s child would appear to be the irrevocable end, but so did the fact that her father was responsible for the death of his son a few seasons ago, and that didn’t happen either. The acceleration and amplification of Olivia and Fitz’s relationship this season happened when Lizzie leaked the photos that Liv was staying at the White House, leading, domino-style to Fitz’s divorce, and Olivia’s position as de facto first lady. Olivia continually fought this position for what she wanted (let’s not forget, releasing her father from prison so that she wouldn’t have to get married), and this is the end result. Maybe after so many years of pulling strings behind the scenes, her recent stint in the White House and her appreciation of Mellie’s current position mean that she’s ready to step into the spotlight and be a policy-maker herself. Rhimes’ book quotes Cristina Yang’s last words to Meredith on Grey’s: “He’s not the sun. You are.” Olivia choosing herself this episode would indicate that she is the sun as well. I’m sure Olitz shippers’ hearts are breaking right now, but it seems that Olivia, like Cristina, like Meredith, like Rhimes, apparently, is choosing herself over love. I still predict that Scandal’s last episode shows us Olivia as Vermont’s newest senator, while Fitz stays home with the kids and makes jam. But for now, that future seems a decent distance away. From Mellie’s closer: “I’m sorry I had to resort to theatrics to protect what should be basic human rights.” Hear, hear. Scandal returns along with the rest of Rhimes’ Thursday-night lineup on February 11. Happy scandalous holidays, everyone!